One of the things I love about the internet and social media, is that it has given me the opportunity to discover new places and new people around New York. There’s a lot of creative folks scattered around who are hitting the trails of Upstate to uncover great food, history, hidden gems and even getting a new angle on the already popular spots. I’ve been following an account on Instagram for a while now called “Exploring By Sign”. Account creator Steve Bodnar was raised in Camillus, New York and now lives in Geneva where he works in Public Relations. The thirty-year-old Bodnar drives around on the weekends to discover all those really fascinating historical markers that most people ignore. Since I’m also a fan of discovering our local history I wanted to know more about what Steve has uncovered in his travels, so I reached out to him in hopes of discovering more about his project. Most of the signs that I’ve documented are in the Finger Lakes, Greater Rochester and Central New York. But this project leaves the door wide open to cover as much of the Empire State as possible. There’s just so much to explore, enjoy and share. Why such an interest in landmark signs? The signs are very public and very prolific. 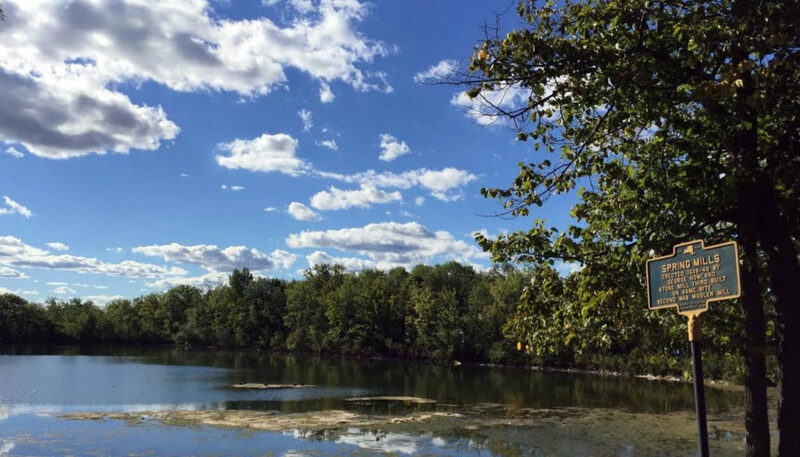 They’re along country roads and throughout cities, situated at waterfalls, parks and scenic overlooks, tucked in front of famous homes and landmarks, and posted at old mills, schools and farms. They’re everywhere. The signs are designed to engage the public through concise bits of information. I’d say almost tweet-like in length – just enough text to get the point (well, most of the time anyway). But, the signs represent much more than embossed lettering on metal. I’m a big fan of history, travel and storytelling. To me, the signs connect all three, creating the perfect mashup for a “choose your own adventure” experience. 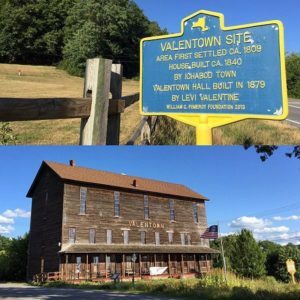 Each marker is a launching point for further discovery – be it the landscape, local attractions, exploring new places or digging deeper into New York history. I’m curating and sharing that experience on Instagram. For anyone interested in signs and landmarks, there’s a bigger opportunity for exploration. Or, at the very least, you might end up with a pretty cool road trip through your own community. 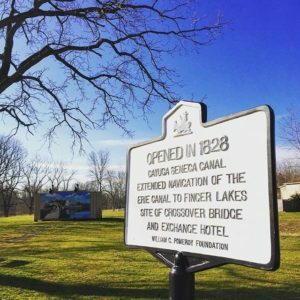 Do you only have an interest in historical landmark signs? Or, are there other landmarks you take note of as well? The focus of @ExploringBySign is mostly to record the historical signs located across New York. 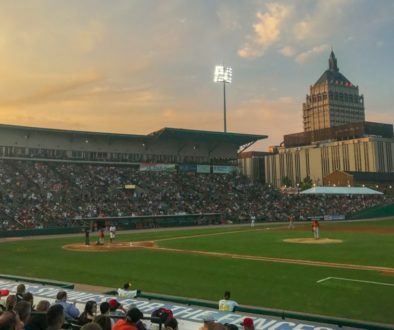 But, the utility of a project like this, and the ability to neatly curate using Instagram (or your social platform of choice), shows how someone might plan and navigate their own adventure by leveraging public resources. Use your imagination! For example, @ThePostalProject is doing good work recording all of the country’s Post Offices. How do you find signs? Just drive aimlessly? 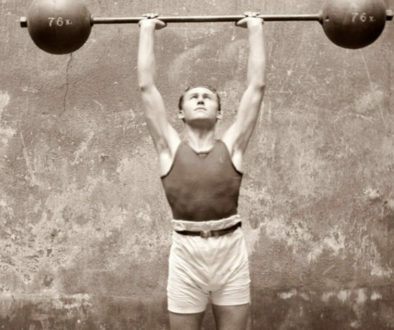 Do you have a resource you use to read about them ahead of time? I love the spontaneity that goes with a lightly planned road trip. I’ll pick a destination or a scenic route, and drive. Many of the signs I’ve documented have been reached by chance. However, not all exploring needs to be fortuitous. 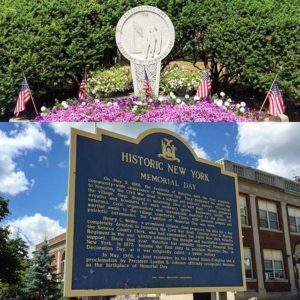 There’s lots of great resources on historical markers out there and the signs that dot New York, and many other states, are well documented. How many signs exist in New York? The Historical Marker Database shows a whopping 5,000+ results for markers when doing a search for just New York State. However, the database also covers plaques and other types of markers. 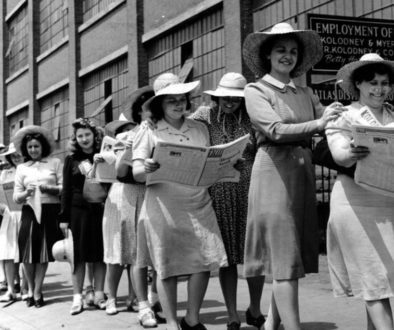 The Department of Education alone put up more than 2,500 between the 1920s and the 1960s. 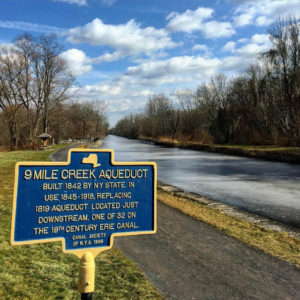 “Sure Signs” says more than 1,000 of those signs were placed in CNY, with about 900 remaining as of 2014. The William G. Pomeroy Foundation has put up more than 300 to date. My thought, and it’s really just a guess, is between 3,000 to 3,500 at the minimum. What’s the process for a historical marker to be placed? 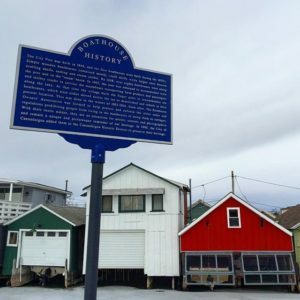 What’s the future of historical marker signs? Have we stopped installing them? Or, are there still plenty of people interested in placing them? 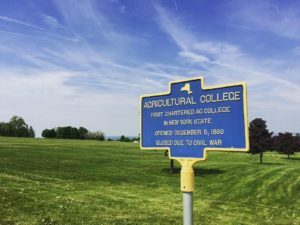 In recent years, the William G. Pomeroy Foundation has paved the way for new signage placements in New York through its Historic Roadside Marker Program as well as through other funding efforts and partnerships. They have an application process. According to the foundation, they’ve placed 325 markers in 48 counties across the state since 2006. And over the years, many others have funded and supported these types of signs. Historical societies and historians in individual communities may have more locally tailored information about sign placements. How often do you go sign hunting? I’m usually documenting signs at least once a week. Are there areas/regions that you’ve noticed have more signs than other areas? Any idea why? From what I’ve seen, some communities or routes do have noticeably more historical signs than others. Local historians might be able to address this on a case by case basis. What’s the most unusual/unique sign you’ve encountered? The most unusual one that I’ve documented is a double-decker mileage sign in Marcellus, New York. It’s also my favorite. The dual sign is in the style of the “traditional” historical markers and was likely cast at one of the same foundries. Instead of offering a sentence on history, it gives directions: AUBURN → 13, ITHACA → 52, 6 ← MARIETTA, 29 ← CORTLAND. It’s got a lot of character and exudes history in-and-of itself. There’s a similar mileage marker in Lodi, New York. What’s your favorite part of the state to drive through while sign hunting? Why? I’m an outdoors enthusiast so anywhere there’s signs nestled into the natural landscape, I’m interested. 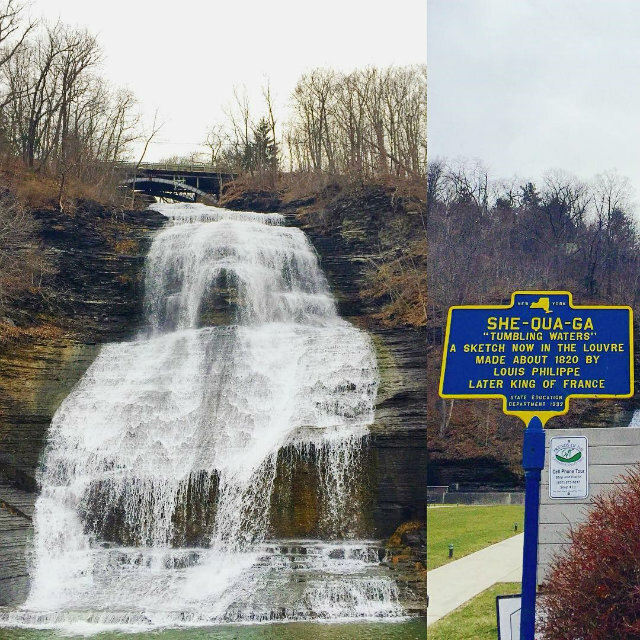 The Finger Lakes is the perfect place for a backroads drive with great views and plenty of signs. There’s also lots of historical markers in and around the Adirondacks. I was there earlier this summer and I wasn’t disappointed. Do you recommend any other Instagram accounts with a similar purpose? 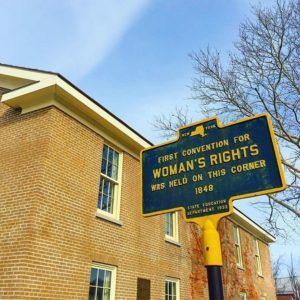 In terms of historical markers, @history_happened_here has compiled an interesting selection of New York signs. And, @historical_markers documents signs, plaques, and more, while posing the question: was the event historic or historical? 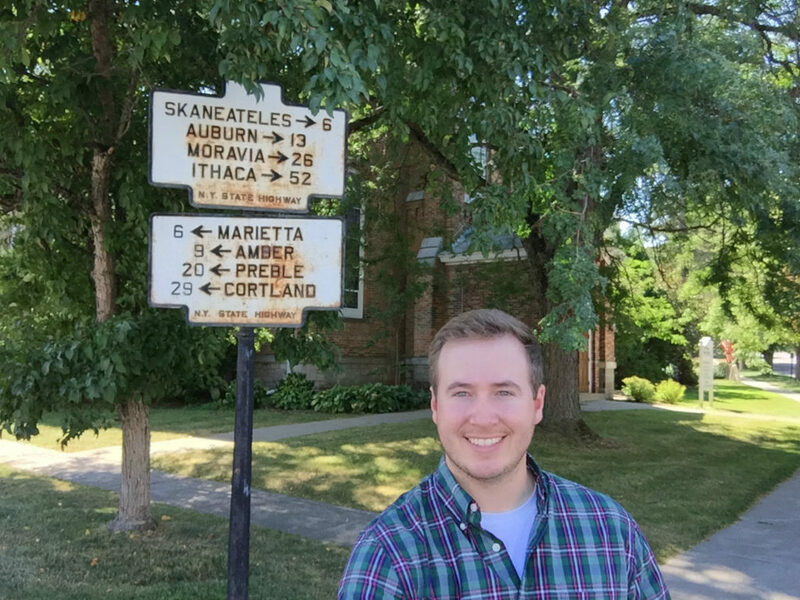 To follow Steve around Upstate while he discovers each of the historical markers in New York, you can follow his personal account over at @stevenbodnar or the @ExploringBySign account on Instagram.